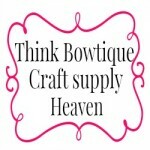 Think Bowtique is your #1 source for headband elastic making supplies in Australia. See our huge range of elastic's from FOE elastic, Velvet elastic, glitter elastic, double frill velvet, skinny elastic and stretch lace elastic here in Australia. Want to complete your headband with a stunning flower? Than you must check out our huge range of hair flower supplies. We can help with your headband making supplies, lingerie, modern cloth nappies and craft elastic's. Frilly lace elastic 1 metre.